Bathrooms can be cleaned and trash can be picked up, but Joshua trees cut down by vandals in California cannot be put back together. Media reports and National Parks Service photos show that several Joshua trees have been cut down since the partial government shutdown started nearly three weeks ago. Park Superintendent David Smith said that the trees were damaged during the shutdown as people created their own dirt roads. “There are about a dozen instances of extensive vehicle traffic off roads and in some cases into wilderness,” Smith added. “We have two new roads that were created inside the park. We had destruction of government property with the cutting of chains and locks for people to access campgrounds. We’ve never seen this level of out-of-bounds camping. Joshua trees were actually cut down in order to make new roads.” A park fence was set to start Thursday to stop the damage of the trees but was called off after officials announced that Federal funds would be used for park water. Joshua Tree National Park has remained open to drivers since the shutdown began. But campgrounds closed for about a week after a park announcement mentioned health and safety concerns. Campgrounds reopened on Thursday. During the shutdown, with Joshua Tree National Park open but no staff on duty, visitors cut down Joshua trees so that they could drive into some areas where vehicles are banned. Fees for entering and camping aren’t being collected, park officials said. Though it’s unclear the extent of damage inside the park, photos have shown fallen Joshua trees. 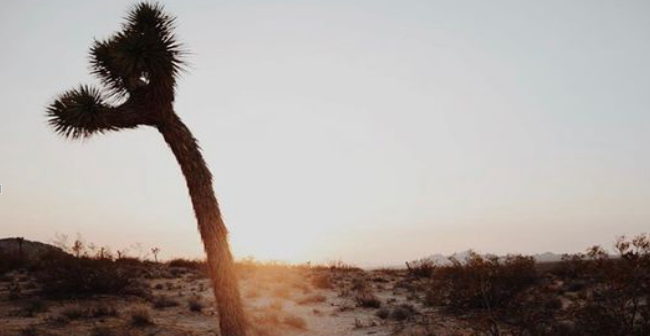 Native to the desert, Joshua trees often grow from a half-inch to 3 inches per year, according to the National Park Service. Some researchers have said the tree can live as long as 150 years. 1. What happened to the Joshua Tree National Park during the government shutdown? A Bathrooms weren’t cleaned by anyone. B There was trash here and there. C Joshua trees were put back by tourists. D Several Joshua trees were cut down by vandals. 2. Why did the vandals cut down the Joshua trees? A They planned to make new roads for camping. B They wanted to take photos of the trees. C They tried to destroy the government property. D They wanted to build new roads for the park. A Partial governments were shut down three weeks ago. B The government property in the park suffered losses. C A park fence to protect the Joshua trees was set immediately. D There were no staff working in the park during the shutdown. 4. What does the last paragraph mainly talk about? A A brief introduction to Joshua trees. B The origin of Joshua trees. C The yearly growth rate of Joshua trees. D A long life of Joshua trees.